New York: Carroll & Graf Publishers, 2000. 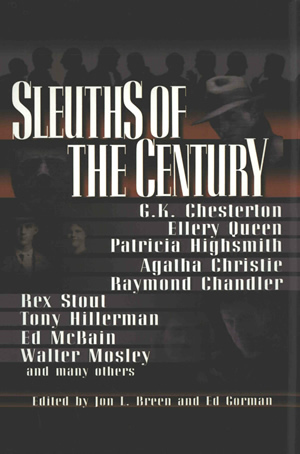 This is Sleuths of the Century, edited by Jon L. Breen and Ed Gorman, containing the short story by Tony Hillerman entitled "The Witch, Yazzie, and the Nine of Clubs." In this story, somewhat contemporaneous with People of Darkness, the newly assigned detective Jim Chee solves a mystery during a long evening attending a Navajo ceremony. The volume also contains work by other well-known mystery writers, for example, Ellery Queen, Agatha Christie, and Ed McBain. This is a hardcover book with dust jacket. Binding: Quarter bound, red paper-covered boards, black paper tape. The title, editors' names, and publisher name are embossed on the spine in gold.